One of your most important responsibilities as a leader is investing time in others, helping them be more productive and effective. That's not an easy transition to make for many technical practitioners; perhaps you are one of them. You enjoy doing project work, and you're very good at it. It's hard for you to shift from doing to directing. Busyness may also prevent you from being effective as a leader. You have so many pressing duties that finding time to guide, encourage, and teach others is exceedingly difficult. You struggle to tackle the tasks on your own to-do list. 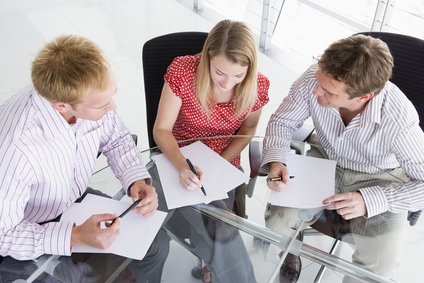 How are you going to carve out time to help your coworkers tackle theirs? You had to figure out things mostly on your own; shouldn't they? Let me ask this: How do you maximize your impact on the firm as a leader? Is it not through the efforts of those you lead? So if you're too busy to adequately engage those you are charged with leading, have you not diminished your impact? These are critically important questions if you consider yourself a leader—or if you aspire to be one. At stake is an indispensable leadership fundamental, what I call the Time Investment Principle. 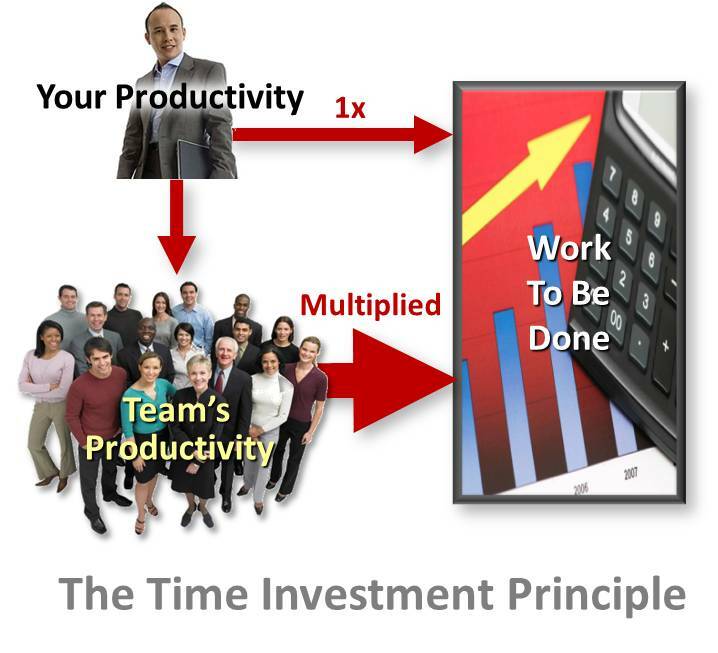 The gist of the Time Investment Principle is that leaders and managers multiply their impact on the organization by investing time helping others be more productive and effective. This is illustrated in the adjoining diagram. If you simply spend your time "doing the work," your impact is measured only by your individual contribution. If, on the other hand, you spend some of that time helping others be more productive, your impact is effectively multiplied. Dedicate a specific portion of your time. The amount will undoubtedly vary over time depending on what activities you are leading. But the principle remains the same: Don't consign this crucial function to leftover time. Determine how much of your time is needed and budget that amount. Make appointments and keep them, or at least reschedule when necessary. Start your day by helping others prepare for theirs. When I was a manager, my office was a snare. Step in there and I found myself easily entrapped in the web of my task list, paperwork, emails, voice mails, inbox, and incessant interruptions. Sound familiar? What I learned was that one of the best ways to assure that I spent time investing in others was to do so at the start of each day—before I stepped into my office. I would compile a list of people to talk to the day before, then spend a little time helping them get ready to make the most of their day. Commit to coaching and mentoring others. Some people need a little guidance, others need more hands-on instruction and encouragement. Those of us who are sports fans recognize the benefit of having good coaching, but rarely consider such an approach as leaders in our firm. But coaching holds tremendous potential for improving performance both on the field and in the office. Whereas coaching is more on-the-job with a performance focus, mentoring fills the need for more offline, career-oriented counseling. Measure your success through the growth of others. An important leadership function is helping others grow and improve. This not only enables you to get the organizational results you need, but build capability for sustained success. As a leader, your performance metrics should be largely defined in what those you lead accomplish. The usual financial metrics are useful, but I'd recommend adding other leading indicators such as specific behaviors, improvement, and intermediate milestones. Be sure to celebrate success with your team. Does applying the Time Investment Principle sound too time intensive? It doesn't need to be. You need to allocate your time with others in proportion with your particular leadership role. But leaders at every level need to make some investment of their time in others. The advice here is to be deliberate about it. Like any investment, you have to give up a little now (in this case, your time) to reap a substantial return.